Here we are again, another dreaded anniversary — the Helms Amendment. If you are a contemporary of that legislation’s author, Sen. Jesse Helms, you might also remember the title character from Sinclair Lewis’ powerful 1927 novel Elmer Gantry or the Academy Award-winning portrayal of Gantry by Burt Lancaster in the 1960 film. Rev. Gantry was a evangelical preacher who used religion to destroy the lives of women. So did Sen. Helms. Rather than repeat the inventory of the amendment’s inhumane results or making the case to overturn it (yes, do! 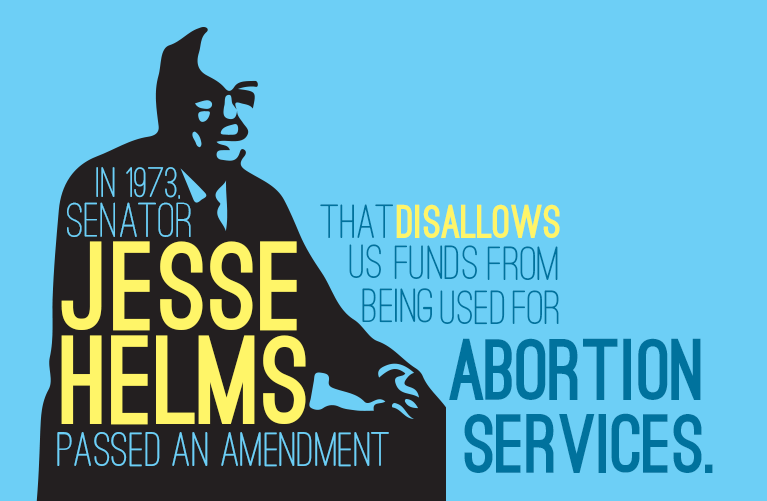 ), let’s turn our attention to Jesse Helms, this legislation’s author, who has faded from public memory since his death in 2008 — or was never even known to younger readers who did not live during his time in power. Sen. Helms grounded his life in religion and a conviction that America was founded on Christian values. (So far, so good; live and let live; anyone is free to believe whatever they want.) Where he went off the rails was in advocating that there was no room for culture or laws that diverged from his Christian-fundamentalist religion’s core teachings and dogma. Yet, the senator took an oath of allegiance to the Constitution, not his personal beliefs. (A friend of mine, while lobbying a male Georgia state legislator about abortion care, was asked, “You wouldn’t want me to vote against my beliefs, would you?” fully expecting her to back down. Instead, she snapped back, “Yes, I would, when your personal beliefs violate my rights.”) In Helms’ case, many of his beliefs and statements did damage to many efforts in our country’s march toward a more perfect union. Helms called Robert Mapplethorpe, an artist who died of AIDS in 1989, a “jerk responsible for producing garbage” and described other modern art as “blasphemous and degenerate,” justification for killing funding for the NEA. As a senator, Helms was a longtime campaigner for voluntary prayer in public schools. Supported a Constitutional amendment to define life as beginning at conception, which would have given a fetus constitutional rights and thus made abortion illegal. Voted yes on maintaining the ban on military base abortions and disallowing overseas military abortions. Voted for the “partial birth abortion” bill banning the “intact dilation and extraction procedure,” the medically accurate terminology for a common procedure used to perform a late abortion. The religious underpinnings of the Helms Amendment followed from the political rise of the author himself, as the founder of the modern conservative movement that dragged social issues into and gradually overtook the Republican Party. Jesse Helms was the Elmer Gantry of the last half century, foisting minority religious views — evangelical Christian views are espoused by only a quarter of the U.S. population — upon the rest of us and dragging a Bible-thumping electorate in his wake. This entry was posted in Abortion, History and tagged abortion, abstinence-only education, AIDS, Boko Haram, Carol Moseley Braun, Christian fundamentalists, civil rights, Civil Rights Acts, evangelical Christian, evangelicals, Foreign Assistance Act, gag rule, gay rights, George Wallace, global gag rule, Helms Amendment, HIV, homophobia, International Women's Day, Jesse Helms, late abortion, legislature, Martin Luther King Jr., Mexico City policy, Mother's Day, National Endowment for the Arts, politics, racism, reproductive rights, Robert Mapplethorpe, school prayer, Sinclair Lewis, Strom Thurmond, women's health by Anne Hopkins. Bookmark the permalink. Anne Hopkins has over the course of seven decades experienced most reproductive health issues known to woman: illegal abortion, exposure to gonorrhea, birth control, pregnancy, childbirth, motherhood, tubal ligation, ectopic pregnancy, ovariectomy/hysterectomy, menopause, and hormone-replacement therapy. In her spare time, she rose from clerk-typist to corporate executive and did a bunch of open-cockpit biplane flying. She is enraged by today’s assaults on women’s health that her generation fought so hard to guarantee.